In the 1985 film ‘Back To The Future’, the hero Marty McFly travels back in time, accidentally becomes embroiled in his parents’ lives and almost causes them to split, threatening the existence of his future self. This ‘grandfather paradox’ is one of many thought experiments around time travel which explore the unanticipated consequences and doom-loops associated with attempted interventions in time. When a firm securitises its future income streams, it pulls that income forward in time. It may also use a variety of holding companies and clever accounting wheezes to realise that income in jurisdictions which are most tax efficient. The firm here is like a portal: it materialises future income in the present in a jurisdiction of its choosing, that would normally remit over a number of years in a specific locale. Banks do this kind of thing all of the time, but so do many non-financial firms, and not just through their securitisation practices. For example, Carillion effectively ‘pulled income from the future’ when they booked profit based on forecasts and estimates. Revenues were recognised with reference to the stage of completion of construction contracts implied by the proportion of costs incurred to the balance sheet date compared with the estimated final costs of the contract at completion. Where this was difficult to estimate, they booked revenues and costs based on forecasts of what they believed the total profitability of the contract would be (see p.95-97 in Carillion’s 2016 accounts). In other words, annual profit was imputed as a proportion of the imagined future profit of each contract. The job of the profit and loss statement is not to follow cash (that’s what the cashflow statement does), but rather to render the operating activity meaningful for investors to make an assessment of the company’s performance. So there is some justification for this kind of accounting when cashflows are lumpy. Nevertheless, it is unusual that the profit and cash profile of a company should diverge so markedly as in the case of Carillion (see Figure 1). It is difficult to guess motive, but booking profit in this way (or at least not impairing total contract profits earlier) allowed Carillion to pay large dividends which looked feasible from a profit and loss point of view, but was not sustainable from a net operating cash perspective. Figure 1 shows the full extent of the divergence: between 2012 and 2016 Carillion’s accumulated post-tax profit was recorded as £668.9 (*£611m using the restated 2016 figures published in the September 2017 earnings update), even though it generated net operating cashflows of just £166.4m (*£29.9m, in the restated figures) over that time period. It then paid out £398.4m (*£370.9m in the restated figures) in shareholder distributions over that time; which was 59.6% (*60.7%) of total accumulated net profit, but 239.4% (*1240.5%) of accumulated net operating cash. Note: these figures differ from those in the House of Commons briefing paper because we use a net rather than gross cashflow from operations figure. The net operating cashflow figure is a closer comparator to the net profit figure because it also accounts for financing costs and tax paid. Note: ‘Net operating cashflow’ = Cash generated from operations minus financial income received/paid, acquisition-related costs and taxation payments. *Note: the restated 2016 figures were published in the September 2017 earnings update. Dividends and buybacks are paid from hard cash not ‘on-paper’ profits, so it is likely Carillion used debt to pay-out to shareholders; another inter-temporal transfer. Debt allows you to bring forward cash today in exchange for a creditor claim on future income. That debt was (at least notionally) secured against the assets of the firm. But as noted, a sizeable proportion of those assets (37.7% in 2016) were intangible, mostly goodwill. And the valuation of goodwill is also premised upon future estimates: its value is supposed to reflect the net present value of the forecast earnings of the underlying cash-generating assets, so goodwill also includes assumptions about discount rates, growth rates and cash flow forecasts. Carillion therefore borrowed money – secured against assets the value of which depended on the accurate forecasting of future cashflows and discount rates – and paid out dividends, which were affordable according to profit figures calculated as a percentage of expected total contract value. Carillion were in effect ‘levered on the future’. But the summonsing of a benign future in the present can affect perceptions of risk and change strategic calculations in the present in a way that makes the future summonsed much less likely to occur. This is the grandfather paradox of fair value accounting. By paying out dividends against aspirational profits, using debt secured against assets whose value depends on the accuracy of the company’s own forecasts, it hollowed out the firm in the present, made it less able to adjust to unanticipated events and thus undermined its own forecasted future. The flipside to bringing cash forward by borrowing against an expected future is that it has the capacity to hollow out the firm’s shareholder funds. When dividends exceed net operating cashflow and are paid out of debt, shareholder funds adjust downwards just as other liabilities increase. Shareholder funds as a percentage of total liabilities fell from 26.1% to 16.5% between 2012 and 2016 (on the non-restated figures). Second, it is likely that the fragile financial position increased the present costs of future liabilities and created an unwanted feedback loop with assets priced on a net present value basis. The fragility meant Carillion could not attract traditional bank loans, and instead relied on a liability structure which included a private placement borrowing of £361m, £170m of convertible bonds, a £112 Schuldschein loan, as well as a £790 million Syndicated Multicurrency Revolving Credit Facility (2016 accounts, p.46). Bank loans and overdrafts were largely floating rate, LIBOR-linked and unsecured (p116). This will have increased borrowing costs and added risk because the private placements were largely dollar denominated, which left them exposed to currency fluctuations after the Brexit vote. All of this increased the firm’s costs of capital and thus (likely) the discount rate, which will have put downward pressure on contract and goodwill valuations. The rising present costs of capital undermined the forecasted future profit, which must have fed through into impairments in the present. The present and future thus interact in a self-reinforcing and damaging way, reminiscent of processes like downward liquidity spirals in financial markets. Third, the problem with inscribing profits in the way Carillion did, is once it was recognised that those profits were unlikely to materialise, adjustments concentrate in very narrow time-spaces, which create bankruptcy risks. One less-recognised risk of fair value accounting is that it creates ‘go-to-zero’ risks which are sudden and lethal. Operational problems about delays, rising contract costs and diminishing margins led to a review of contract performance. The outcome of that review was that the firm impaired or made provisions for £1045.5m of faltering contracts in one accounting year, recognising that past profits had been booked too optimistically. The likelihood of diminished future cashflows were also recognised via a £134 goodwill impairment; joint venture receivables were also written down £147.5m (Carillion interim report 2017, p.31). Even in 2016, an actuarial re-measurement of net defined benefit liabilities of the pension fund wiped out £439.7m of shareholder funds (although this was later restated at a lower rate). The hollowing of the firm in the present on the basis of an expected future meant the company was unable to deal with these developments. 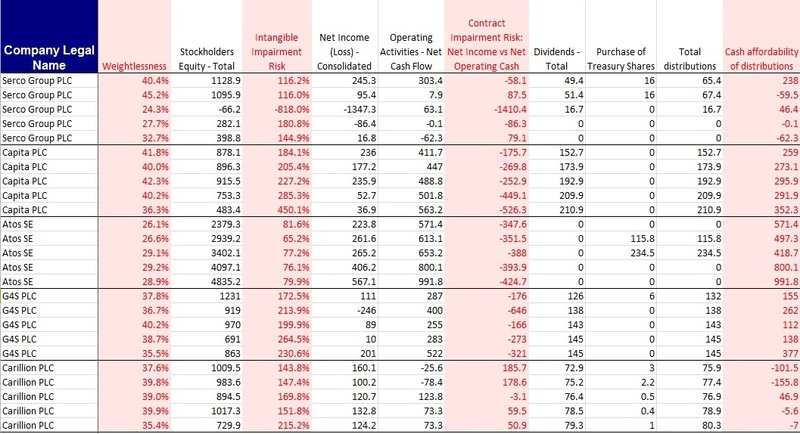 With shareholder funds hollowed out and its cash position parlous (all of the cash it reported on its balance sheet was claimable by its creditors), writedowns on a small number of contracts cascaded through the balance sheet, leaving it insolvent. A number of questions remain. Why did Carillion continue to pay dividends despite its weak cash generation and depleting shareholder funds? Carillion’s dividend policy was linked to its ‘earnings per share growth’ (p.125), so it may be that senior management were afraid that any change to that policy might give investors cause to ask questions about the robustness of Carillion’s earnings figures. It might also be that senior management believed that the dividend became the lens through which investors assessed the stability of the firm; another form of signalling. But one overlooked possibility is that senior management were responding to what they perceived to be the interests of a relatively concentrated and thus powerful bloc of shareholders. Close to 40% of Carillion’s shares were held by just 7 firms (see below). I have not done the research, but this ownership pattern may be common to many firms reliant directly or indirectly on the state, and where there might be (wrongly as it turned out) a perception that these companies would not be allowed to go to the wall. A ‘weightlessness test’ which looks at the percentage of total assets accountable for by goodwill. This: i) is a measure of futurity: how much of the firms’ present value is accountable for by goodwill, ie the net present value of future cash flows, over and above book value ii) examines what might be recoupable to future creditors in the event of bankruptcy; where goodwill is inseparable from the firm as it ceases to become a going concern. A ‘goodwill impairment test’ which divides goodwill by shareholder funds. This gives some sense of how much intangibles would have to be impaired to wipe out shareholder funds completely. A high multiple means a relatively low impairment would bankrupt the firm. A test for ‘contract impairment risk’ which looks at the relation between net income and net operating cashflow. A positive figure suggests a firm is over-booking profit, a negative figure means a firm is cash generative despite what is reported in the Profit and Loss statement. 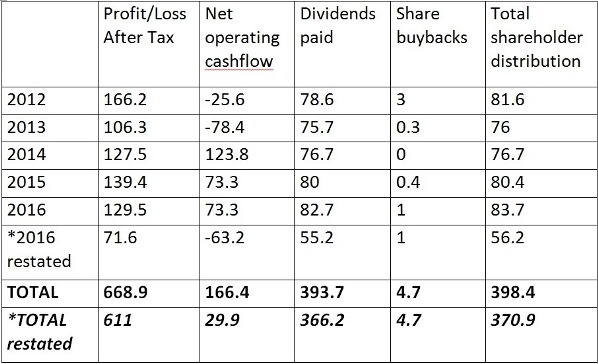 A ‘distributional affordability’ test which adds dividends and buybacks and assesses whether those distributions are affordable out of net operating cashflow. Note: Figures differ slightly from Figure 1 due to different source data. On weightlessness, Capita has the largest proportion of goodwill relative to total assets of the five. Carillion, Serco and G4S have similar profiles; Atos is the least ‘intangible’ company. On goodwill impairment risk, again Capita looks most exposed – with goodwill more than four times its total stockholders’ equity in 2016. That means a goodwill impairment of around 25% would wipe out the firm’s equity. Carillion and Serco have similar profiles to each other but are still risky at 1.1 to 2.1 times more goodwill than shareholder funds; G4S is risker still with goodwill to equity of around 1.7 to 2.6 times; Atos has the lowest ratio of the five. The ‘contract impairment’ test shows why Carillion rather than the other firms were the most shorted stock on the FTSE index. Carillion is the only firm that consistently reports net profits higher than its net operating cashflow, suggesting an adjustment was always imminent, and also explains their parlous cash position. All other firms were (healthily) generating more net operating cash than net profit, suggesting the law and accounting experts were working overtime on their tax efficiency. Finally, Carillion were making distributions in excess of their net operating cashflow in all years bar one – again, another indicator that their business model was unsustainable. This is risky, not just financially but legally if the firm is drawn into a difficult discussion about its compliance with the 2006 Companies Act. Impairments may be driven by the discount rate as much as faltering operations. One reason we should fear movements in the stock market, particularly if driven by concerns that the era of cheap money is coming to an end, is that this could significantly affect the discount rate in goodwill and contract valuations. Goodwill as a proportion of total assets is now much higher in many firms; and if firms lever up against that – then any discount-rate driven impairment could prove to be hugely disruptive. That’s worth knowing in the context of Brexit and its uncertain implications for interest rates. Business models – and the means by which they account for their activities – have morphed to accommodate cheap credit; they are now dependent on it. It remains to be seen whether there are enough redundancies in these firms to withstand significant movements in the cost of capital. Another lesson from Carillion is what this tells us about the firm in general. I have suggested the firm has become ‘portal-like’, shifting income and obligation in time for elite advantage. This is undeniably the case for Carillion (up until it collapsed) where a small bloc of influential shareholders were able to extract income in excess of net operating cash, facilitated by a board whose bonuses were earnings per share linked. The firm is being treated instrumentally – less a site of accumulation and more a site of inter-temporal income consolidation and extraction; a potentially disposable intermediate vehicle between debt markets and investors, and thus a repository for elite risk. This kind of instrumentalism was at the heart of other examples of elite extraction, such as BHS and Thames Water. This inter-temporal shifting of income and obligation makes companies like Carillion a little bit like a bank. They were certainly engaged in the process of maturity transformation. More indirectly, they may even have been creating credit in the way that they booked profit. Perhaps the lesson of Carillion is that it might be time to start regulating companies dependent on state contracts like we do banks, and compel them to hold regulatory capital to prevent the kind of moral hazard which allows elites to dump liability on the state? Finally, as a post-script, the Carillion case invites us to reassess what we understand by financialization. It is undoubtedly true that firms have always gamed accounting rules, and so practice of this kind should not automatically be thought of as ‘financialized’. But what Carillion and numerous other examples of corporate failure now show, is that firms do not necessarily need to accumulate capital to make elites rich. Financial instruments can be put to the task of extracting cash not accumulating capital in a more predatory form of capitalism. Scholars of financialization perhaps need to engage with this reality a little more and explore how financial instruments, measures, logics and practices make one class of person rich at the expense of another through a process of de-temporalisation and extraction. Because the outcome of this process is not one that will necessarily be felt in real time by all, but will be observed through the slow-motion degradation of living standards and opportunities of the young.